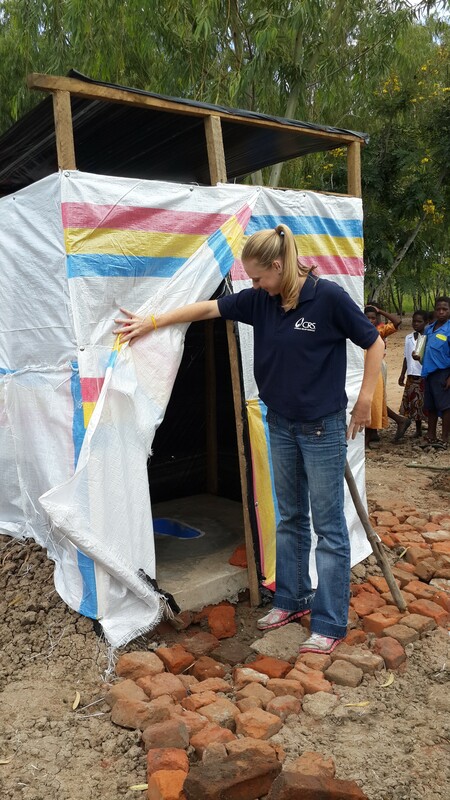 Following the devastating floods in Malawi, fellow and School for International Training Graduate Institute alumna Erin La Croix supported the CRS WASH team implementing emergency response in 26 camps for displaced people in Southern Malawi. Our response ensured that people had access to safe drinking water and sanitation while in the camps. CRS also supported safe hygiene practices in the camps. 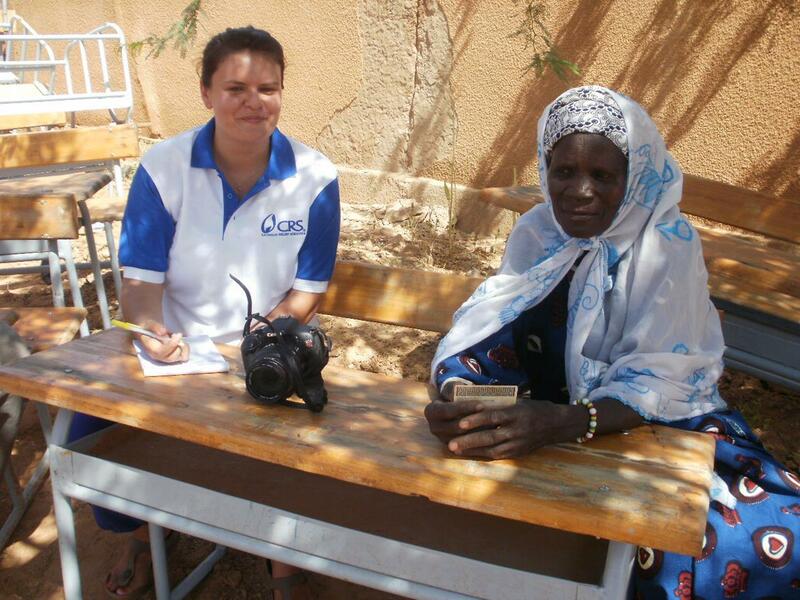 Over the last 4 months, I have gained immense hands-on experience in emergency WASH programming, partner collaboration and management, as well as working closely with the donor to develop and update program budgets and interventions. Thank you to the CRS Malawi WASH team for this invaluable experience which I hope to build upon during my temporary duty in Bangladesh. 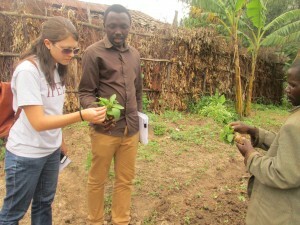 Jerica with Janvier, the food security team leader, and a coffee grower, right, in the Keurig Green Mountain project, who shows one of his crop seedlings. The project helps farmers improve agriculture and business practices to grow their livelihoods. Rwanda fellow Jerica Youngken was interviewed by the Pennsylvania Catholic Conference about her experiences overseas as a fellow. The beauty of the fellowship program is that we [the fellows] are exposed to many different areas of programming and operations, enabling us to gain a true sense of what we would like to pursue after the fellowship ends. Read more about her experiences. 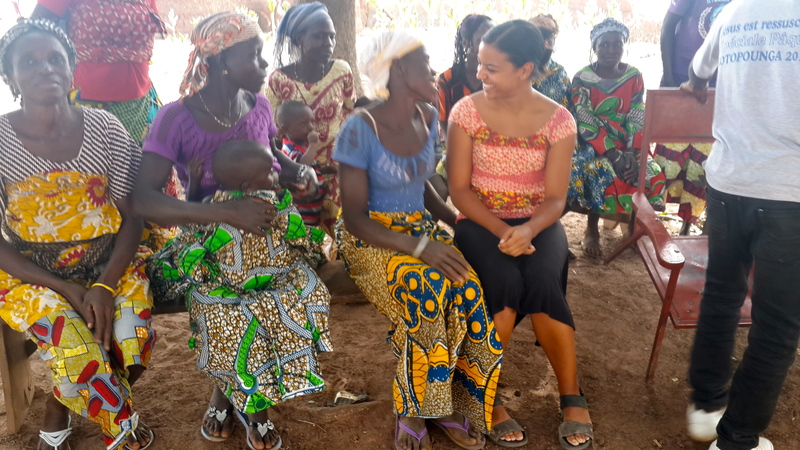 Angie Tyler with the participants of a project that offers health insurance to SILC participants in Northern Benin. 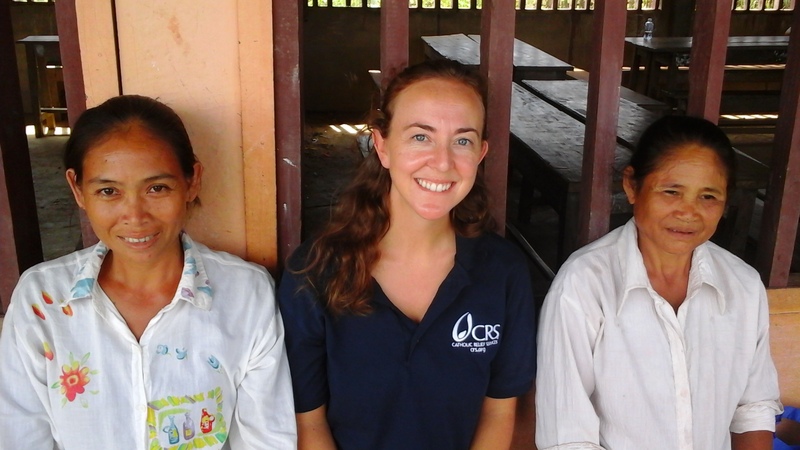 CRS Benin fellow and Johns Hopkins University School of Advanced International Studies alumna Angie Tyler meets with St. Joseph Health Center staff to discuss health insurance for rural populations participating in mature Savings and Internal Lending Communities, or SILCs. 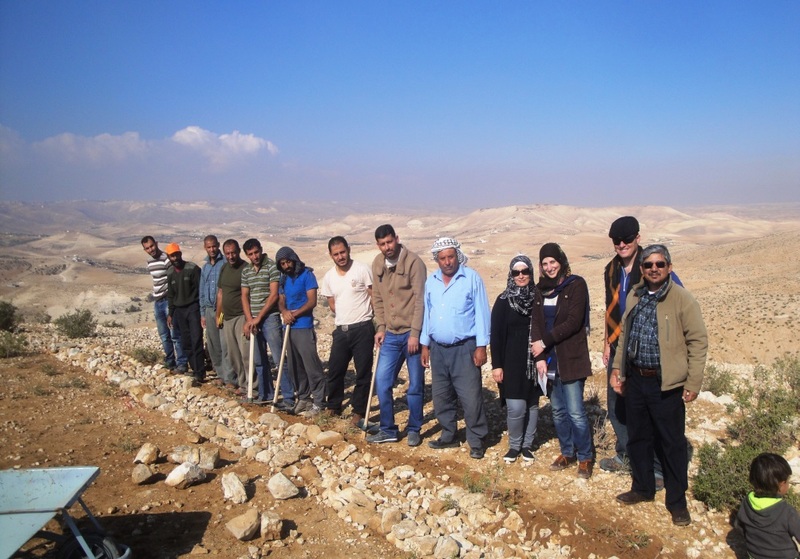 Local herders, partner organization staff and CRS staff after completing training on constructing contour walls for soil and water conservation. Fellow Daniel Pasquini-Salazar is second from right. Read more about Daniel’s experience. Michelle with mothers of disabled children at community-based rehabilitation training in Xaibouathong district, Khammouane province. 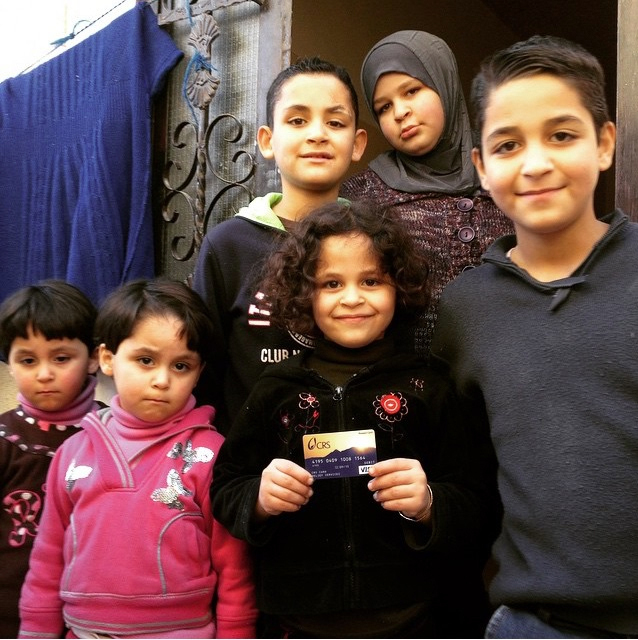 Jordan fellow Maggie Holmesheoran managed a pilot project to streamline assistance by providing Syrian refugees access to prepaid debit cards. Indebtedness and issues with landlords have become serious social issues in Jordan due to overcrowding, as more than 80% of Syrian refugees in Jordan live in urban areas either with host families or in rented homes. When card users in this program could access their money independently, it improved their sense of self-confidence, and also made them feel more normal, which is really important for people who are in the midst of a crisis. Read more about Maggie's experience. Philippines fellow Julia Leis supported the Typhoon Hagupit response in Eastern Samar, assisting with distributions of shelter; water, sanitation and hygiene, and household kits. Below is an excerpt from Julia’s blog about the year after her graduation from Tufts University. In my current work in the Philippines as a CRS fellow, where CRS has been working since 1945, I have worked with exceptionally talented Filipino and international colleagues in Manila, Davao, and Tacloban City. 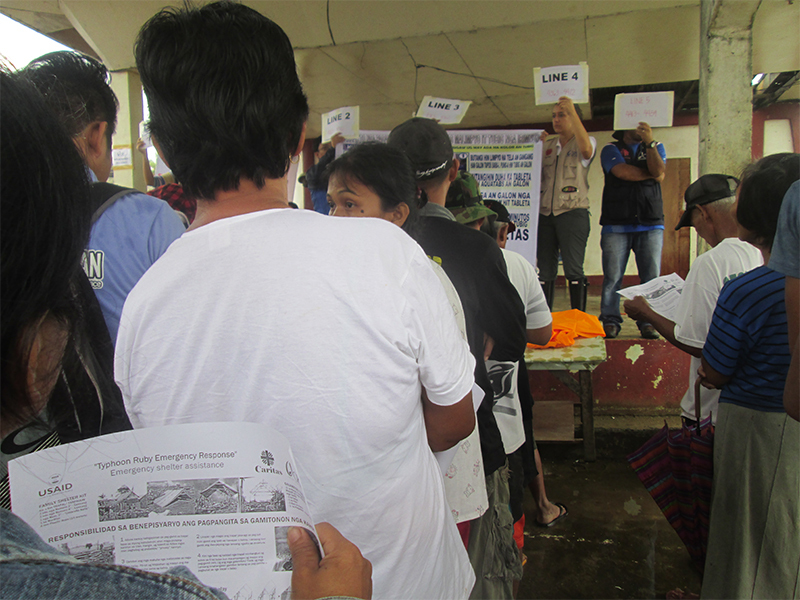 In Eastern Leyte and Samar, CRS is responding with shelter, WASH, and livelihoods programming after Super Typhoon Yolanda devastated the area in November 2013. I’ve supported multiple projects, including an urban disaster risk reduction program called SUCCESS—Strengthening Urban Communities Capacity to Endure Severe Shocks—in Metro Manila, and the Typhoon Hagupit emergency response in Eastern Samar in December 2014.